If you’ve ever been told that you could make easy money and it sounds too good to be true, it probably is. 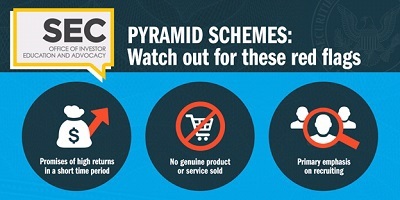 Pyramid schemes often sound like enticing business deals, but fraudsters may use this “business model” – to take advantage of you. Before you invest your time and money, it’s important to ask good questions and do some research on the company. Find more information on identifying pyramid schemes and how to protect yourself at investor.gov. This information is also available in Spanish.